Three distinctive groups from the OIC Member States benefited from the programme. The 3-week training course included one-week theoretical knowledge and two weeks of practice. Each group consisted of five countries with 20 participants in total. This included the participation of one medical doctor and three nurses from each country. 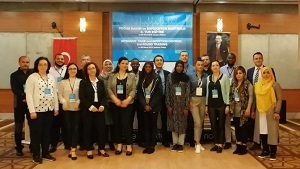 The training represented a great opportunity for healthcare professionals to share long-established knowledge and experiences in the area of infection control and intensive care in OIC countries. The aim was to provide a dynamic balance in maintaining the life of the individuals with physiological function disorders, developing their skills in preparedness for critical conditions and immediate response and for improving the relevant service quality. The training was organised within the framework of the OIC Strategic Health Programme of Action (OIC SHPA) 2014-2023, under Thematic Area 1 on “Health System Strengthening” and aims to support the development of the health workforce capacity as one of the most important components of health system strengthening. The third session of the training was offered to Bangladesh, Afghanistan, Gambia, Bosnia and Herzegovina, and Albania.